Here at Embroidery Library, we absolutely love getting your requests! 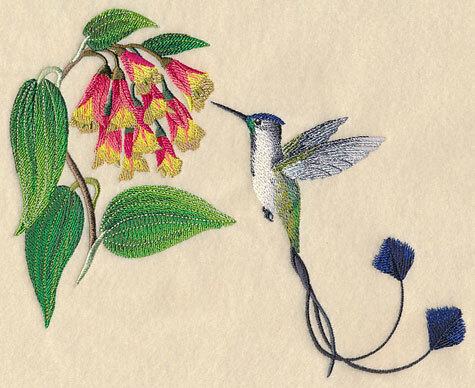 Embroiderers have the best ideas for new designs, and we adore the floods of inspiration that fill our email inboxes. Each week we create one new design based on a special request, and when our inbox overflows with standout ideas, it's time for a "request-fest" where ALL the new designs are based on your ideas! There are tons of new designs to explore, including beautiful hummingbirds, intricate one-color bears, floral seed packets, and more! Scroll down the page to see the excellent new designs that were all inspired by YOU! 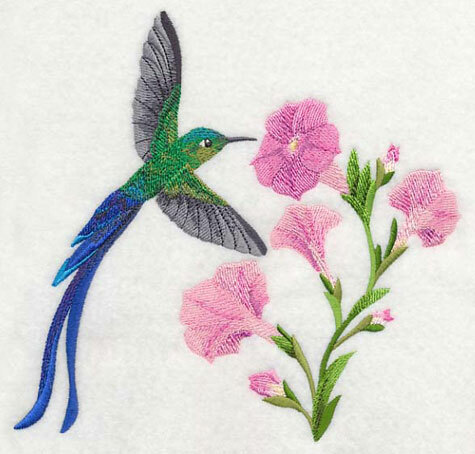 Let a beautiful hummingbird land on your new favorite cardigan! Kristin sent in her idea for a design featuring the Long-tailed Sylph Hummingbird, a majestic bird that is native to South America. The extra-long tail feathers on these hummingbirds are absolutely magnificent, but they're actually so long that the feathers hinder their flying! Thanks, Kristin, for your request! 7.78" x 7.41" and 7.22" x 6.87" and 6.14" x 5.85" and 5.09" x 4.86"
Kristin was also hoping for a depiction of the Marvelous Spatuletail Hummingbird, who have equally impressive tail feathers. They live mainly in Peru and have just four feathers on their tails -- two of which are long, racquet-shaped feathers that end in large violet-blue discs. 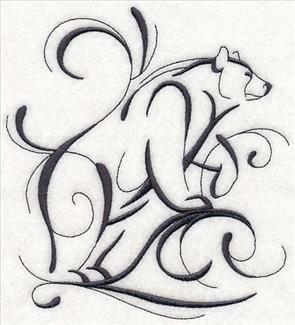 8.84" x 6.88" and 7.48" x 5.82" and 6.24" x 4.85"
Both Kathryn and Karen love our Intricate Ink series, and wanted to bring the graceful, contemporary style to one of their favorite animals -- a bear! 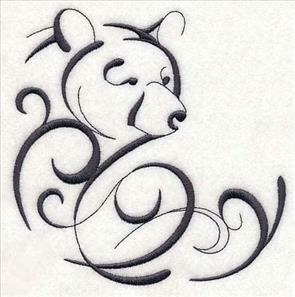 We loved the idea, so we decided to create five new inky bear designs to choose from! 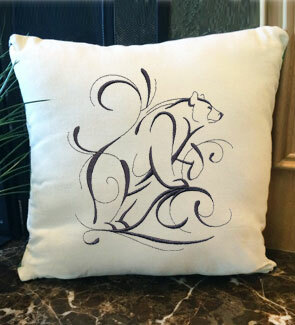 5.85" x 6.46" and 4.85" x 5.36" and 3.49" x 3.86"
Jazz up a simple pillow with one of these majestic bear designs! 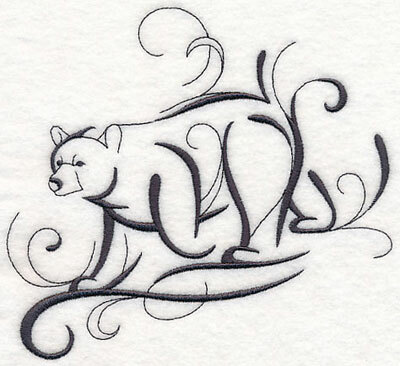 To create these inky bears, we used long, elegant strokes and a single color for a whimsical appeal. Alternating between thinner and thicker lines gives the bear design added depth. 6.40" x 5.86" and 5.31" x 4.86" and 3.85" x 3.53"
This ethereal bear design is the perfect option for adorning placemats, blankets, or towels. Stitch it alone, or pair it with one of the other Intricate Ink Bears for a full collection. 9.40" x 3.14" and 6.00" x 2.15" and 3.87" x 1.29"
The light-stitching and elegant designs are terrific options for embellishing low nap towels, shirts, and tote bags. We love the idea of using all the designs together on a quilt, too. Stitch these beautiful, intricate bears as striking additions to shirts, table linens, tote bags, and more. The designs can be ordered on their own (just click on the links shown above!) or buy them in a design pack! Click on a link below to see the designs in the pack, sizes and prices. Anne loves flip-flops (and the weather that comes with them!). 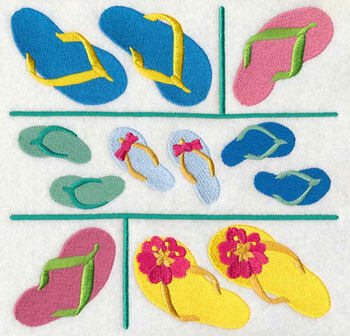 She suggested a handful of designs celebrating the summertime sandals, and we loved the idea. 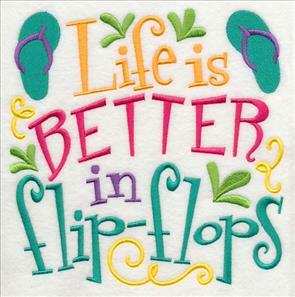 After all, life truly is better with flip-flops! 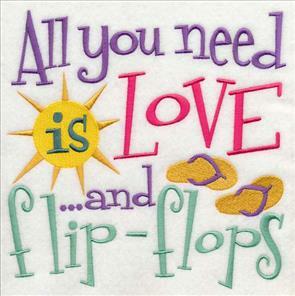 7.78" x 7.81" and 6.90" x 6.92"
7.80" x 7.71" and 6.99" x 6.91"
5.95" x 5.89" and 4.92" x 4.86"
To accompany our flip-flop samplers, we also created a collage featuring the warm weather wear. Try adding the design to a beach bag, beach towel, or outdoor cushion. 7.79" x 7.81" and 6.89" x 6.90" and 5.85" x 5.86" and 4.84" x 4.85"
Shauna and Carol are both big fans of the Country Charm Seed Packets series, and were hoping we could expand it to include more flowers. Of course we can! 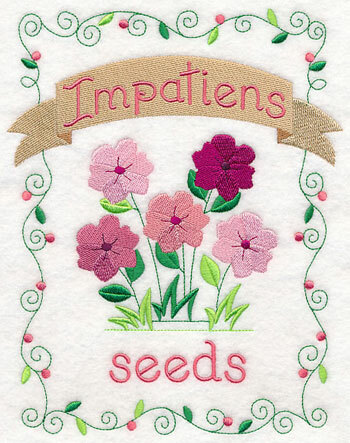 We've added designs for impatiens, snapdragons, forget-me-nots, marigolds, sweet peas, and petunias. 6.89" x 8.67" and 6.20" x 7.80" and 5.84" x 7.35" and 4.84" x 6.10" and 3.06" x 3.85"
In addition to the seed packet designs, we also added floral border designs to coordinate. Pair the two types of designs together to create matching sets of embroidery projects -- try them on pillow covers, linens, and more! 11.75" x 4.68" and 9.40" x 3.75" and 7.80" x 3.11" and 6.00" x 2.61" and 3.85" x 1.54"
Ever-popular snapdragons get their name from the fact that you can gently squeeze the sides of the exotic-looking flower and see the flower snap closed -- just like the jaws of a dragon! 6.89" x 8.76" and 6.14" x 7.80" and 5.84" x 7.42" and 4.86" x 6.17" and 3.03" x 3.85"
The beautiful blooms come in a variety of gorgeous colors. 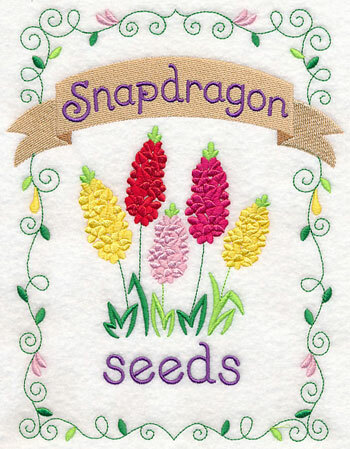 Here the snapdragons are depicted in yellow, red, and two shades of pink. 11.75" x 4.56" and 9.41" x 3.65" and 7.81" x 3.03" and 6.00" x 2.52" and 3.85" x 1.50"
Forget-Me-Nots get their name from a German legend. While God was naming all the plants, a tiny unnamed one cried out, "Forget-me-not, O Lord!" God replied, "That shall be your name." Another version of the tale says God was handing out colors, not names, and the forgotten one was left with just a very small amount of blue, explaining why the flowers are so small. 6.88" x 8.70" and 6.16" x 7.80" and 5.78" x 7.33" and 4.86" x 6.15" and 3.04" x 3.85"
Add this pretty band of forget-me-nots as a border on a tea towel, placemat, or table runner. 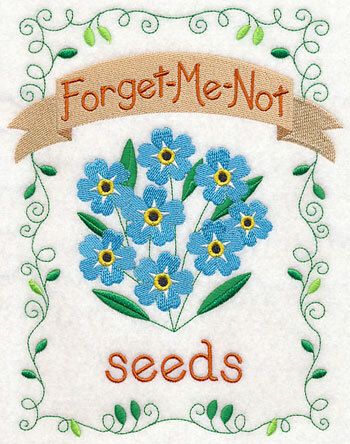 The bright blue flower is a springy addition to any embroidery project. 11.72" x 4.52" and 9.38" x 3.62" and 7.78" x 3.00" and 6.00" x 2.51" and 3.87" x 1.51"
Marigolds are known for their distinctive coloring -- an intense combination of yellow and orange -- and their strong, pleasant smell. Their sunshine-like appearance is great for cheering up any garden. 6.89" x 8.77" and 6.12" x 7.81" and 5.82" x 7.42" and 4.86" x 6.20" and 3.04" x 3.88"
Part of the popularity of marigolds lies in their ability to bloom brightly all summer long, from spring to fall. The flowers have daisy-like, or double carnation-like flower heads and are produced singularly or in clusters. 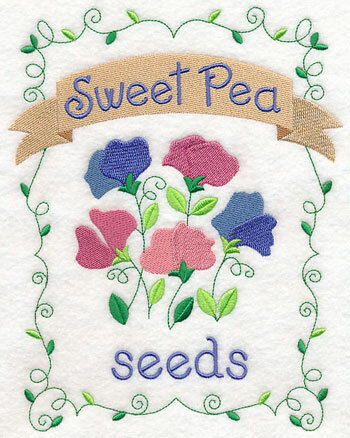 11.71" x 4.65" and 9.38" x 3.73" and 7.80" x 3.10" and 6.00" x 2.58" and 3.88" x 1.55"
Henry Eckford, a Scottish nurseryman, developed the sweet pea. While serving as the head gardener for the Earl of Radnor in England, he cross-bred the flower and turned it into the floral sensation of the late Victorian era. 6.89" x 8.69" and 6.19" x 7.80" and 5.84" x 7.36" and 4.86" x 6.12" and 3.05" x 3.84"
While the flower can come in a variety of colors, such as pinks and purples, the yellow sweet pea remains elusive. Mix and match the colors in this border to fit your home decor! 11.75" x 4.53" and 9.40" x 3.62" and 7.80" x 3.01" and 6.00" x 2.31" and 3.85" x 1.49"
Petunias are a particularly easy flower to grow, making them a favorite for gardeners everywhere. 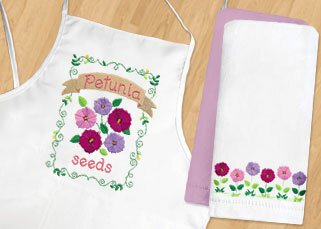 Try featuring the fabulous petunia seed packet design on pillows, aprons, tote bags, and more! 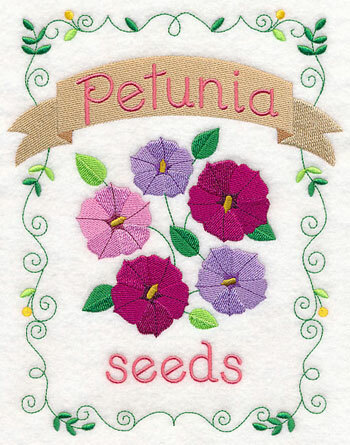 6.89" x 8.69" and 6.20" x 7.81" and 5.84" x 7.37" and 4.86" x 6.12" and 3.05" x 3.86"
Petunias have wide, trumpet-shaped flowers and come in a nearly limitless variety of colors. Mimic their charming look and delightful gardening appeal with this colorful border design. 11.76" x 4.59" and 9.41" x 3.67" and 7.81" x 3.05" and 6.00" x 2.63" and 3.85" x 1.51"
Create a fabulous kitchen set with your favorite floral seed packet and border designs. 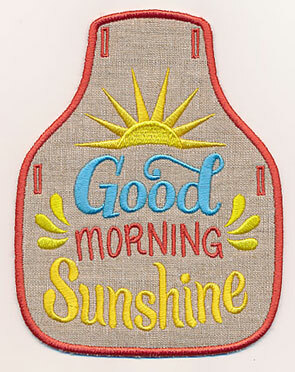 We love adding them as colorful embellishments for an apron and matching tea towel. You can also add the springy designs to placemats and table runners, or as cheerful additions to your gardening gear. 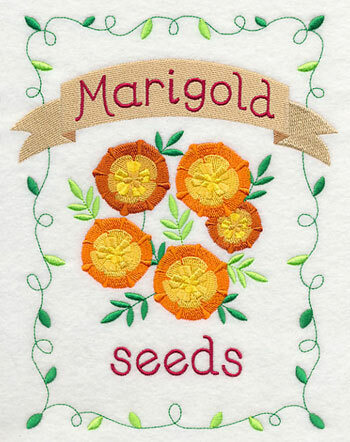 Bring country charm to your embroidery projects with fresh seed packets and delightful floral borders! Design packs below include either seed packet designs or floral border designs -- get one of each for fabulous project possibilities! Order the designs individually by clicking the links above, or get the pack with all 6 designs. Five sizes are available to suit any project. Click on a link below to see the designs in the pack, and add the pack to your cart. **XXL - Designs smaller than 7"x11.8"
**XL - Designs smaller than 7.9"x7.9"
**Lg - Designs smaller than 6"x10"
**Md - Designs smaller than 5"x7"
**Sm - Designs smaller than 4"x4"
**XL - Designs smaller than 6"x10"
**Lg - Designs smaller than 7.9"x7.9"
Isabel sent in a request asking for a few freestanding Battenburg lace designs to dress up her towels, table runners, pillowcases, and more. The delicate lace was developed in the late 1800s and named after Queen Victoria's son-in-law. 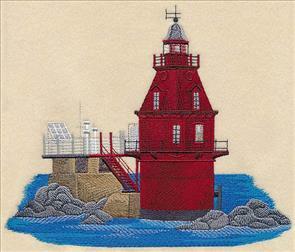 It gets its distinctive look by using cotton thread to replicate a classic hand-crocheted look. Find special instructions for using these designs right here. 11.38" x 2.51" and 9.11" x 2.51" and 6.84" x 2.50" and 2.31" x 2.50"
The elegant look of Battenburg lace makes it the perfect go-to for stylish home decor projects. They're just right for dressing up dining room linens, or giving a hint of sophistication to pillows and tablecloths. 11.39" x 1.52" and 9.12" x 1.52" and 6.85" x 1.51" and 2.31" x 1.51"
The creation of Battenburg lace was one of the major motivators behind the revival of the English lace-making industry. The lace is commonly used in a variety of projects that range from bookmarks to ornaments. 11.40" x 1.53" and 9.13" x 1.53" and 6.86" x 1.52" and 2.32" x 1.52"
While often used as a popular embellishment for wedding gowns, this lace can also dress up everyday apparel. Try it as a border around the bottom of a pair of capris, or to highlight the cuffs of your sleeves. 11.40" x 2.53" and 9.13" x 2.52" and 6.86" x 2.52" and 2.32" x 2.51"
Usually Battenburg lace is a bit heavier than other machine laces because it uses cotton thread. Learn more about using this type of design here. 11.40" x 1.53" and 9.13" x 1.53" and 6.85" x 1.52" and 2.31" x 1.50"
The intricate stitches that hold the freestanding lace together often resemble mesh, netting, or webs punctuated by embroidered designs. Often flowers or other specific shapes are formed using the lace -- here we opted for a freeform variation. 11.38" x 2.55" and 9.12" x 2.54" and 6.85" x 2.53" and 2.32" x 2.51"
Susanne is a big lighthouse fan and has visited over 500 lighthouses in the past ten years! 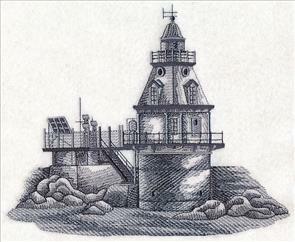 She wrote in to request a design to show off the Ship John Shoal Light, which marks the north side of the ship channel in Delaware Bay. 8.44" x 6.90" and 7.13" x 5.86" and 5.95" x 4.86"
Irene requested a bright and sunny bottle apron design to match the other sunshine designs. She plans to make a matching set -- apron, dish towel, pot holder, placemats, and a bottle apron! 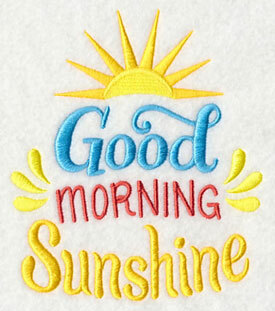 We loved the idea, and created this "Good Morning Sunshine" design to add to her collection. Stitch the design alone, or learn how to make the bottle apron here. 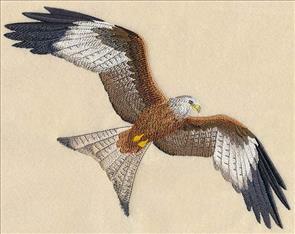 4.86" x 5.64" and 3.32" x 3.86"
Yvonne wrote in to say that she was hoping for a design featuring a Red Kite -- and we were happy to oblige! 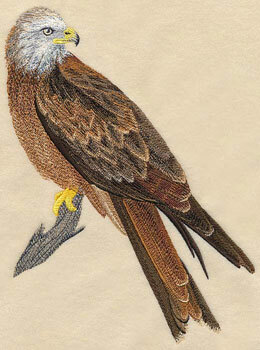 This impressive bird of prey is native to Europe and Africa, and is a beautiful, elegant creature. We chose to show it in two forms -- one in flight, and one perching. Thanks, Yvonne! 9.46" x 6.89" and 7.77" x 5.74" and 6.66" x 4.85"
a popular program, and designs are scheduled through the middle of 2016. But we still want to read your ideas! Send them to support@emblibrary.com. We'll add them to the list of designs to be created!